The name of Gyselbrecht will forever be linked to their stellar achievements from Barcelona, including most notably their international victory from Barcelona in 1995 with Laureaat Barcelona, the pigeon that gave this breed its international reputation. 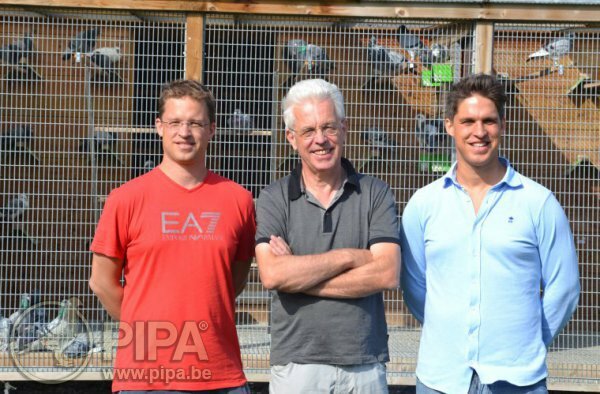 This success story took root in 1983-1984, when father Remi Gyselbrecht and his sons Carlo and André went to visit fellow fancier Andre Vanbruane in Lauwe, looking for top class pigeons for Barcelona. A first round of youngsters from most of Vanbruane's best breeders arrived in Knesselare in 1984, and that was the starting point of a great career. Today, 35 years later, the invaluable Barcelona bloodline of the late Andre Vanbruane continues to play a pivotal role in Carlo Gyselbrecht's breeding loft, mainly through the direct descendants of the fantastic Laureaat Barcelona himself, as well as with the help of some invaluble descendants of the old Vanbruane breed. That explains why Carlo's pigeon breed is still regarded as one of the most precious collection of Vanbruane descendants across the globe. 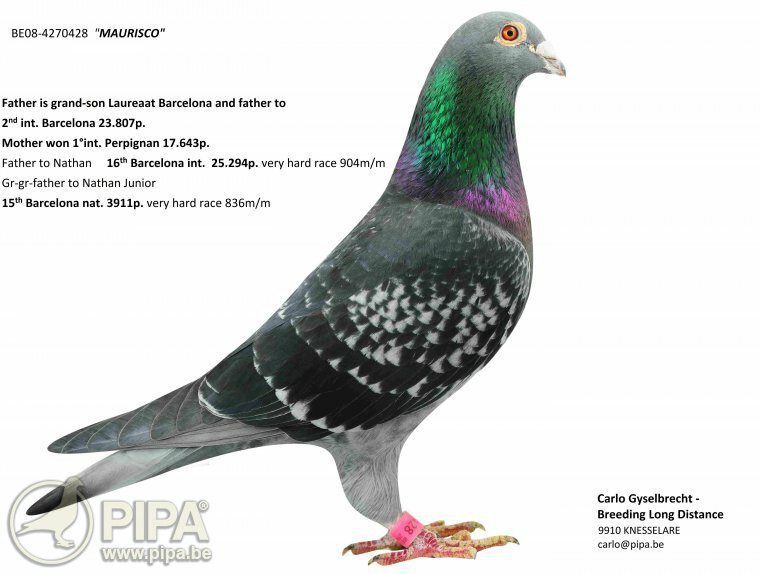 Laureaat Barcelona became the leading name in the Carlo Gyselbrecht pigeon breed, and the most prominent member of this family. 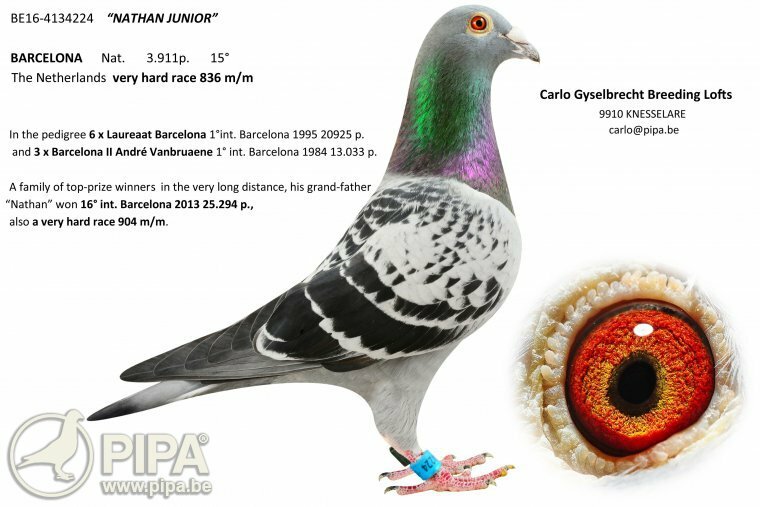 One of his most famous descendants is without doubt New Laureaat BE08-2222675, winner of a 1st International Barcelona 25,382 pigeons in 2013 for Luc Wiels. Meanwhile, he developed into a fantastic breeding bird for Batenburg-Van de Merwe/PEC in Klaaswaal. 15. Nat. Barcelona 3,911 p.
Nathan's pedigree is a good example of Carlo's well thought out pairings and his efforts to further incorporate the Laureaat Barcelona bloodline into his existing breed. He is a son of Kleine Lazeroms NL02-1987517 (of J.P. and Bjorn Van Kerckvoorde), which is the sire of a 2nd Intnat. Barcelona 23,708 p. (and a grandson of Laureaat Barcelona). He was paired to Mariska NL05-1415959. Mariska has won a 1st Intnat Perpiginan 17,643 p. and an 8th Nat. St.Vincent 5,204 p. for Jan Roobol (she comes from a pairing of the Klamper bloodline of Cor de Heijde x Witbuik of Batenburg-Vd Merwe). A double granddaughter of Laureaat Barcelona. She is a daughter of Sampras Laureaat BE99-4511934 (from 1st Intnat Barcelona Laureaat Barcelona x Nestzus Sampras, winner of a 2nd Nat. Barcelona in 1999) x Rose BE99-4449089, a half sister of Schumacher (bred from Laureaat Barcelona x Bijou of Vd Wegen). Mother Nathan is also the grandmother of a 20th nat. Narbonne 3,187 p., a 47th Nat. Pau 3,530 p., a 91st Nat. St.Vincent 2,569 p. and a 272nd Nat. Barcelona 3,911 p., as well as the great-grandmother of a 15th Nat. Barcelona 3,911 p. in 2018. New Laureaat is also a decendant of Bijou. Click here for Nathan's pedigree. One of Nathan's highly talented sons is Roderik BE15-4268055. He was bred from Nathan x Sigrid BE04-4297774 (click here for Roderik's pedigree). Sigrid is herself inbred to Laureaat BE86-4414972, a super class breeder in the Gyselbrecht lofts that stems straight from Andre Vanbruane (bred from Laureaat 257/83, a 3rd Nat. 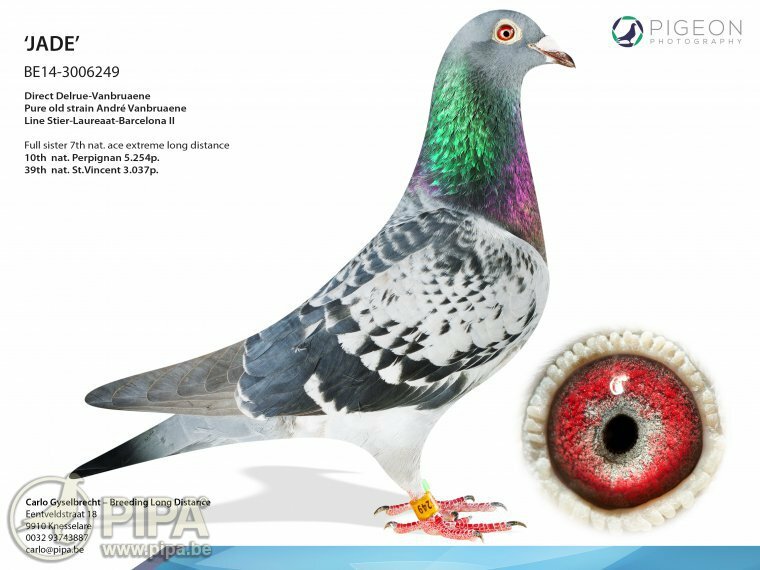 Ace Pigeon Long Distance KBDB of Vanbruane) and in turn the sire of Laureaat Barcelona, Turbo, and many others. Sigrid is a daughter of Narcis Laureaat BE97-4432698, one of Team Gyselbrecht's many stars from Barcelona (he is a son of Laureaat Barcelona x Narcis '95, a full sister of a 2nd Intnat. Barcelona 24,908 p.). Narcis Laureaat was paired to super class breeding dam Delphine BE98-4567692, a daughter of Turbo BE91-4561810. Turbo won a 76th Intnat. Barcelona 24,908 p. and a 96th Intnat. Barcelona 20,943 p., and he is a half brother of Laureaat Barcelona, being a son of Laureaat 86-972. Narcis Laureaat is also grandfather to New Laureaat. Nathan Junior carries the noble bloodlines of Laureaat Barcelona, and that of his sire 'Laureaat': his sire - Roderik - is a grandson of the aforementioned Delphine, and his dam is Huub-duivin (also the dam of a 33rd Bergerac NPO 21,204 p.). Huub-duivin is a direct daughter of Delphine (a daughter of Turbo and a granddaughter Laureaat). The father of Huub-duivin is inbred to the famous Barcelona II from Andre Vanbruaene. Click here for Nathan Junior's pedigree. It was no surprise that Nathan Junior was quickly transferred to Knesselare after his fantastic result from Barcelona, to join Carlo Gyselbrecht's extensive collection of breeders. This is a pigeon with quite a promising future as a breeder. Also a lot of direct children of New Laureaat from Batenburg-vd Merwe/PEC are introduced in the Carlo Gyselbrecht breeding loft. The results at the loft of Hugo Batenburg with this fantastic breeding line are really impressive. The introduction of pigeons of Andre Vanbruane in the lofts of Gyselbrecht was a major success, and Laureaat Barcelona obviously played a pivotal role. 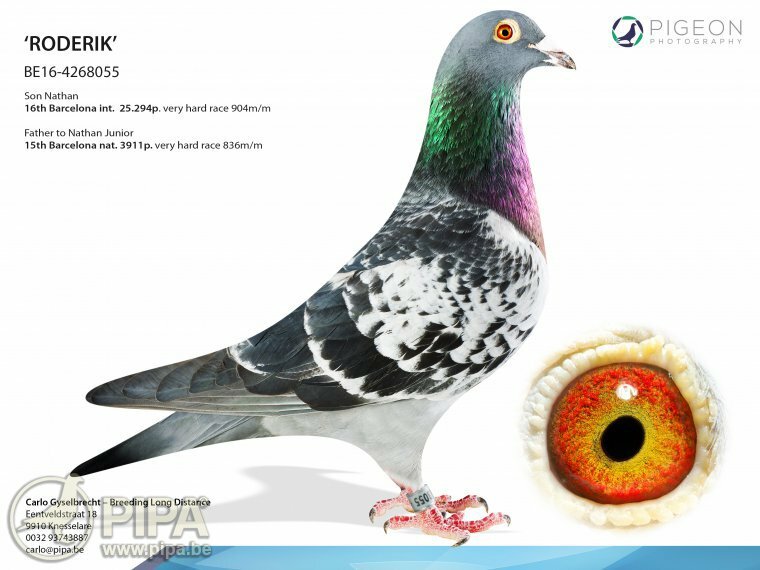 He is a powerful pigeon and of course an outstanding stock breeder. But Carlo Gyselbrecht has always been quite fond of the other top lines of Andre Vanbruane as well; he repeatedly invested in pigeons that came straight from the Vanbruane loft. In fact, the breeding loft in Knesselare is one of the few lofts in Western Europe that still has an extensive collection of descendants of the renowned marathon breed of Barcelona star Andre Vanbruane. Andre's breed is one of the cornerstones of this pigeon family. 18. Nat Narbonne 6362 p. – 20. Intnat 13,351 p. – 1. Club 293 p.
38. Prov Chateauroux 4,093 p.
He is a half brother of Luna: 2. Nat Barcelona 11,802 p. – 4. Intnat  22,887 p.
34. Nat Jarnac   3,906 p.
7. Prov Tulle   1,176 p. – 158. Nat 7,322 p.
103 Nat Agen     4,477 p.
191 Nat Narbonne 3,447 p.
Click here for the pedigree of Inbred Iniesta. And the last hen that caught our attention in Carlo Gyselbrecht's breeding loft is another pigeon with 100% Vanbruane origins: Jade, a direct Delrue-Vanbruane. She is a top quality breeding dam from the same line as Iniesta, being a daughter of Nestsister Iniesta BE08-3003071 paired to Kleine Stier BE06-3003086. All of Jade's grandparents are either youngsters or grandchildren of the magnificent Delrue-Vanbruane stock breeder Geschelpte Stier BE88-3396534. His palmares includes a 2nd Nat. Ace Pigeon Long Distance KBDB, a 31st Nat. Cahors 8,078 p. and a 77th Nat. Brive 23,509 p. (he is a grandson of Barcelona II). He appears in this pedigree four times, including three times in a pairing with Laura BE87-3369466, which is a daughter of Laureaat 257/83 for Andre Vanbruane. He is himself 3rd Nat. 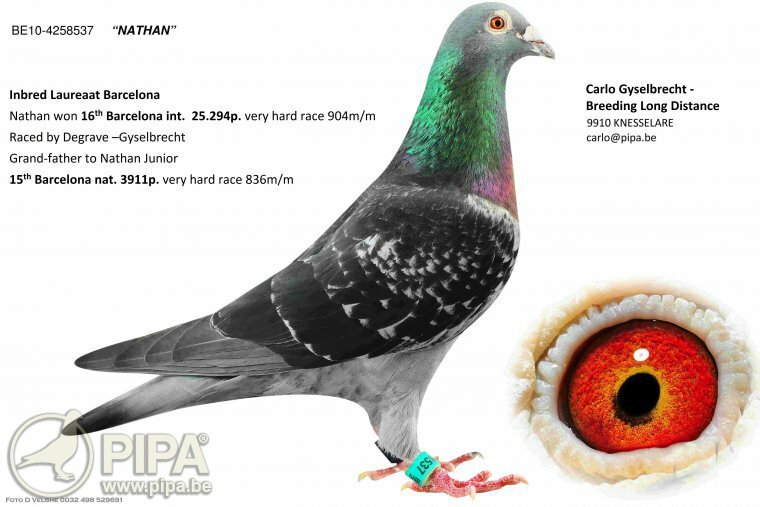 Ace Pigeon Long Distance KBDB and the sire of stock breeder Laureaat 972/86-Gyselbrecht, as well as a grandfather of Laureaat Barcelona-Gyselbrecht. 10. Nat Perpignan  5,254 p.
39. Nat St.Vincent 3,037 p.
Click here for Jade's full pedigree. It has been almost 25 years since the coveted international first prize from Barcelona with Laureaat Barcelona, and his star is still shining in the long distance. Carlo Gyselbrecht was able to embed this bloodline into his extisting pigeon family through inbreeding and linebreeding, and by pairing them again to pigeons of the old Vanbruane foundation. This approach is clearly illustrated by the new top breeder Nathan. The breeding loft of Carlo Gyselbrecht has gained an international reputation for their invaluable collection of Vanbruane pigeons. These pigeons are praised for their determination, their stamina, their perseverance and of course their race winning abilities. In addition, they are able to pass on their race winning abilities to future generations. Unsurprisingly, there is a growing number of pigeon fanciers every season that claim prestigious victories, including national first prizes, with the help of Carlo Gyselbrecht descendants. For the past 25 years, their exceptional breeding has been the key to success. And it always will be.